Building a business is a fantastic and challenging experience. Most of the time I wake up exhilarated to begin my day and sometimes I go to bed feeling overwhelmed and frustrated. As an entrepreneur, it is my responsibility to maintain my entrepreneurial mindset. The secret to success in business and life is to maintain a positive Yes-I-Can-Do-It mindset! Easier said than done, right? Here are 5 keys to help you create and sustain a positive entrepreneurial mindset so you attain the success you desire and deserve. The influence people have over our personal energy is amazing. Moods and attitudes are so easily spread – think about how much of a difference a simple smile from a stranger can make for your day, then magnify it 1000 times to demonstrate the power of positive and successful friends, family and associates. Have you ever heard the saying that you are the 5 people you spend the most time with? When you have people around you who inspire you, believe in you and want you to succeed, there’s no room for doubts and even when they creep up, they’re quickly swept away. Do you start your day out with something positive? Positive statements have been shown to get people through tough times and to help them get back on track when they derail. I have the best of everything! I am receiving money-making ideas daily! I am grateful and celebrate everyday! I have a powerful presence – everyone wants to learn from me! All things are provided through God! I am limitless, powerful, fearless and victorious! We all have negative thoughts from time to time, however, negative thoughts and emotions can derail us and prevent us from achieving all we desire. Of course, catching those negative thoughts takes practice and persistence. When you find yourself thinking negative thoughts or having negative emotions stop and determine if there is any fact behind these thoughts. What can you do in that moment to help you shift out of the negative? You could listen to a favorite song, take a walk outside in the fresh air, or do some exercises. There is further work that needs to be done to help you achieve permanent change but these things will at least get you out of the mood. Have you heard the saying that what you focus on will grow? That’s an awesome thought when you are clear about your goals and the path to get there. But, when your mind starts to go to the negative direction and you let it stay there, you will only get more negative. Since you are focused on the negative, you will get the negative. Gratitude is a powerful and positive tool for success. When you’re grateful for all of the wonderful things and people in your life, the challenges you face seem significantly less important and are more easily dealt with. Consider keeping a gratitude journal and make a practice of writing in it daily. That way, when you’re facing challenges a quick peek at all the amazing things in your life will make you feel as if you can tackle anything. Additionally, an attitude of gratitude helps you maintain a positive perspective and to face challenges as opportunities rather than obstacles. Success is within your reach and with the right attitude you can accomplish anything you set your sights on. Embrace these five powerful mind-success strategies and you’ll build a better business and live a happier, more satisfying life. This post is overflowing with great ideas!! Thank you for going into such great detail! Being grateful and having a mantra are two of my favorite ways to keep my energy high! Your ideas are just wonderful reminders of some of the things we know will help support us, but we overlook them at times! This is a really great post for creating a mind set. I would like to add one that works well for me…. do something for someone else. When I am feeling bogged down and my thoughts are critical of others I do for others. Sometimes it is as simple as a love note. Thanks Michele for a well thought out article. 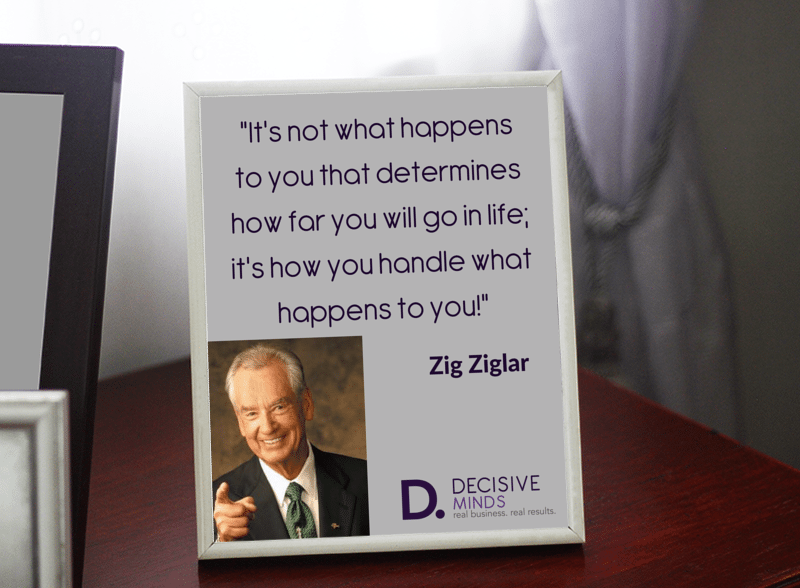 I love that Zig Ziglar quote, so true. on ourselves for thinking negatively. I prefer to smile with satisfaction every time I catch one. After all, you have to have a good mindset to catch one in the first place =).